A yet-to-be installed Ocean Renewable Power Company underwater TideGen turbine sits in Eastport in July 2012. EASTPORT, Maine — Tidal power went from theory to reality Thursday when, for the first time in the western hemisphere, electricity flowed from an ocean-based turbine to the electricity grid. 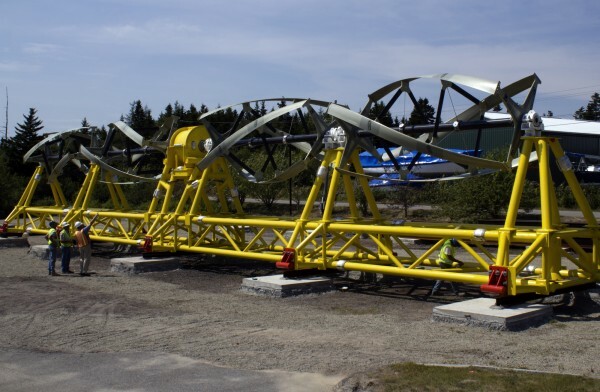 ORPC pursued and won the first contract with the Maine Public Utilities Commission to provide up to 5 megawatts of tidal power. The Portland-based company has been researching, developing and building the submersible turbines, using several businesses around the state and hiring workers in eastern Washington County to get the project off the drawing board and into the water. A significant hurdle was cleared in that long process when the connection went live Thursday. The first turbine generator unit, which comprises four turbines, was installed in Cobscook Bay earlier this summer. It will produce 180 kilowatts at peak, enough to power 25-30 homes. ORPC officials said the two additional power systems expected to be installed in the fall of 2013 will raise production up to 540 kilowatts, enough electricity to power 75-100 homes. The company expects to continue to grow its production capacity in the coming years to eventually meet the 5 megawatt maximum in its contract with the PUC. Sauer said the achievement was substantial. “The historic moment is this is the first electricity that’s ever been delivered to an electricity grid from an ocean resource — whether it’s tidal or wind — in North or South America,” Sauer said. The only comparable project is one using a dam and tidal water in Nova Scotia. The news will put Maine on the map among the many private firms and nations vying to tap electricity from the tides, Sauer said. “This is reverberating around the globe,” he said. Saying he was tired of hearing that Maine was looked down upon elsewhere, Sauer said the success achieved in Cobscook Bay is being analyzed in places such as Chile, where others are trying to tap the tides. “We are a leader in the world in tidal energy,” he said. Thursday’s milestone caps a three-plus year process that began when then-Gov. John Baldacci convened an ocean energy task force charged with exploring the viability of tidal and offshore wind power. The task force met for 18 months and issued recommendations that became law calling for the PUC to contract with companies to produce up to 5 megawatts of tidal power and up to 25 megawatts of offshore wind power. To spur the development, those firms winning the bids would get higher payments from the state’s three big utility companies. The price above the rate paid to other producers will be made up with a systems benefit charge to all electric users. Sauer said it was not corporate welfare but self-interest that drove the task force’s recommendation. “They determined that the economic benefits that would accrue to the state would be a factor of 1.8,” meaning more money would be returned to the Maine economy through jobs and taxes than was being invested in the higher rate paid. ORPC will receive 21.5 cents per kilowatt hour produced, he said, which is higher than the fluctuating price paid to producers on the open electricity market. Bangor Hydro-Electric Co. also cheered the development. “Bangor Hydro is pleased to have played a critical role in this achievement by building the interconnection to get this energy to the power grid,” said Gerry Chasse, the company’s president and chief operating officer, in a press release. Federal Energy Regulatory Commission regulations required Bangor Hydro to build the connection, Bangor Hydro spokeswoman Susan Faloon said Thursday. The nature of the new power was especially attractive to the company, she added. “We’re always excited about new technology, especially when it’s renewable,” Faloon said, speaking from a public expo at which heat pumps and other innovations were being demonstrated. “We played a huge part in this,” she said. Dreams of tapping power from the relentless tides where they are among the steepest in the world date back 75 years. The Passamaquoddy Tidal Power Project was a federal government initiative in 1935.